Shari'a Scripts is a work of historical anthropology focused on Yemen in the early twentieth century. 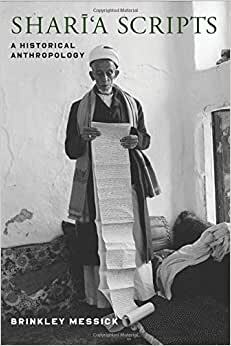 Brinkley Messick uses the writings of the Yemeni past to offer a comprehensive view of the shari'a as a localized and lived phenomenon in a groundbreaking examination of the interpretative range and insights offered by the anthropologist as reader. Start reading Shari'a Scripts: A Historical Anthropology on your Kindle in under a minute. This book explores debates within an Islamic legal tradition about the status of writing and thus of recorded truth. This is an impressive piece of work that draws upon the author's four decades of thought and reading. No one else can move among these Yemeni texts with such assurance, and classic works such as those of Kitab al-Azhar, Sharh al-Azhar and Sayl al-Jarrar are read more closely than any Western academic has attempted previously. ?A formative and distinguished book. Brinkley Messick (PhD, Anthropology, Princeton) is Professor of Anthropology and of Middle Eastern, South Asian and African Studies and Director of the Middle East Institute at Columbia University. He is the author of The Calligraphic State (California, 1993), which won the Albert Hourani Award from the Middle East Studies Association, and Shar-½-+a Scripts: An Historical Anthropology (Columbia, forthcoming) and the coeditor of Islamic Legal Interpretation (Harvard, 1996).